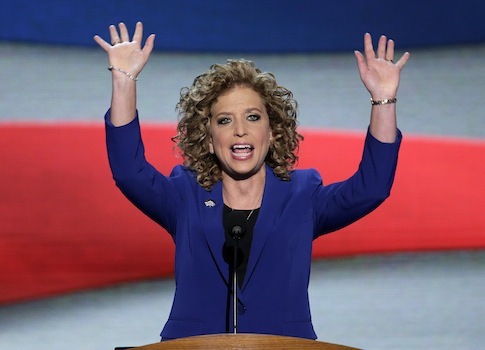 Progressives are pressuring Debbie Wasserman Schultz to resign from her post as chair of the Democratic National Committee following accusations that the party has attempted to pave the way for a Hillary Clinton nomination. Over twenty thousand people have signed a petition launched by progressive advocacy group RootsAction on January 1 that calls for Wasserman Schultz’s ouster. The petition accuses the DNC chair and Florida congresswoman of limiting primary debates and trying to deny Clinton’s competitor Sen. Bernie Sanders (I., Vt.) access to voter data in order to "minimize competition" for the former secretary of state. As of midday Tuesday, the petition had accumulated over 24,000 signatures, less than 1,000 supporters shy of its 25,000 signature goal. The petition had been live for less than five days. Norman Solomon, one of the founders of RootsAction, said in a statement that Wasserman Schultz is guilty of attempting to "manipulate" the election. "The head of one of the two big political parties in the United States is trying to manipulate the presidential election process by limiting direct debate and tilting the national party apparatus in favor of one candidate," Solomon said in a statement Tuesday. "This is unacceptable." Jeff Cohen, the group’s other cofounder, said that Wasserman Schultz’s actions have resulted in Sanders receiving reduced exposure in the media even as he polls better against Republican candidates than does Clinton in hypothetical general election contests. Both Sanders and former Maryland Gov. Martin O’Malley, Clinton’s lone remaining competitors, have complained that the DNC should sanction more primary debates. O’Malley labeled the six-debate schedule "undemocratic" last August, accusing party insiders of trying to "pre-ordain the outcome" of the primary election. Multiple Democratic debates have also been held on weekend nights, likely resulting in lower viewership. Furthermore, the Sanders campaign sued the DNC last month for shutting off its access to the national voter database after a software error allowed a Sanders campaign staffer to improperly view voter data collected by the Clinton campaign. Sanders’ campaign manager accused the DNC of trying to "undermine" and "sabotage" the Vermont senator’s campaign. Shortly after the suit was filed in federal court, the DNC and Sanders’ campaign reached an agreement on the matter. This entry was posted in Politics and tagged 2016 Election, Debbie Wasserman Schultz, Hillary Clinton. Bookmark the permalink.